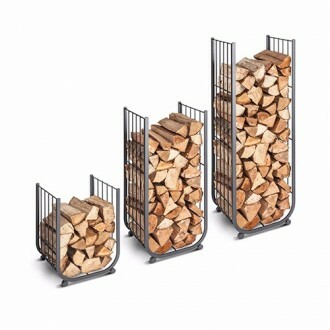 Following the success of our fireguards, we’ve developed two distinctive Log Holder ranges – Traditional and Contemporary Log holders. Both designs are built to our usual high standards and will enhance any style of fireplace. The Traditional Log holder has our familiar woven wirework mesh to support the logs and fit in with most interiors, whilst the Contemporary Log Holder is designed with the linear steel rods for a cleaner, more modern look for a pared down effect. Available in three sizes and two finishes, they look good and will last a lifetime. Get in touch or visit our Log Holder page for more details.